Patti Smith’s new memoir, “M Train,” is the musician/author’s beautifully composed account of her travels and pilgrimages, told through words and photographs. She appears Nov. 22 at Town Hall Seattle. 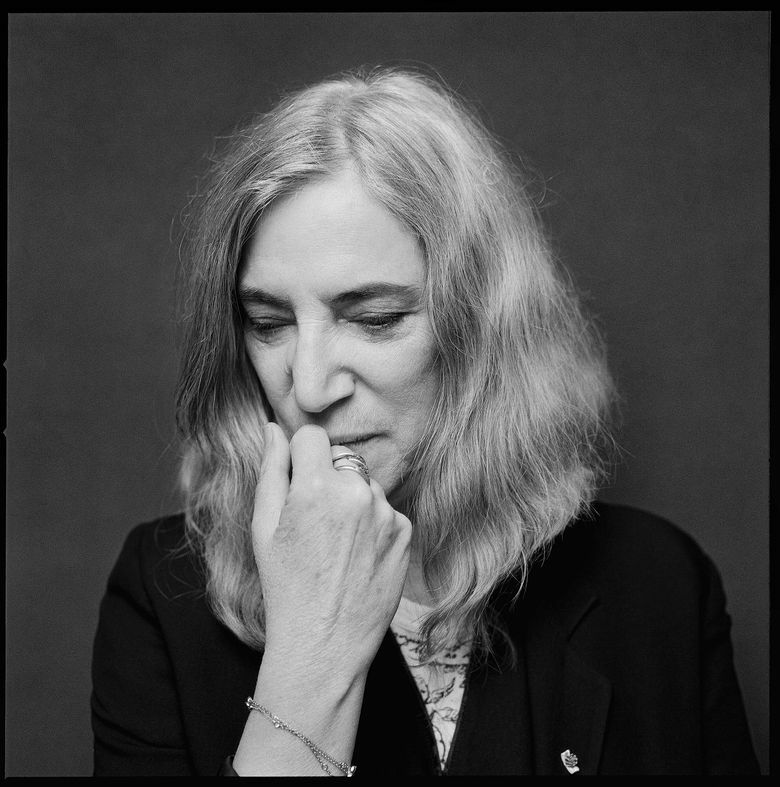 Patti Smith’s “M Train” — a memoir that follows her 2010 National Book Award-winning “Just Kids” — is a beautiful, touching and extraordinarily well-crafted book that for all its formal architecture flows as naturally as if Smith were singing one of her songs. Though the book has been described as a travel memoir, that is a conceit, a frame on which to hang a multilayered meditation on loss, making art, mortality and the sacred. A multimedia work, featuring her austere photographs, it is also a musical book, with its own rhythm, color and dynamics. But rock fans be forewarned. Though Smith was inducted into the Rock and Roll Hall of Fame in 2007 and is universally recognized as a spearhead of New York punk, this is not a book about music. The author of “M Train” will appear at 7:30 p.m. Nov. 22 at Town Hall Seattle. An admission of $30 admits one person and includes a copy of the book. Tickets available beginning Oct. 9 at 10 a.m. at the Elliott Bay Book Co. (elliottbaybook.com) and (206-624-6600). Smith grounds the reader with a recurrent image of herself at home base — drinking black coffee at her favorite Greenwich Village cafe — then launches into quietly vivid descriptions of various pilgrimages — to Saint-Laurent prison in French Guiana to pick up stones to later be placed on Jean Genet’s grave, in Morocco; Frida Kahlo’s and Diego Rivera’s Casa Azul, in Mexico City, where she falls ill and sleeps in Rivera’s bed; or Sylvia Plath’s grave, in Yorkshire, England, where she snaps a brace of Polaroids, hoping to “capture” reality, then finds that she has lost them. Invariably, the real-time trips melt into dreams, ruminations on art, childhood recollections and, most often, elegiac reminiscences of her husband, Detroit guitarist Fred Sonic Smith, who died in 1994. Some of the book is taken up with plain great yarns, like the time she wound up singing Buddy Holly songs with Bobby Fischer. Or the time she completely bombed, giving a talk to the Continental Drift Club, an obscure society devoted to the memory of explorer Alfred Wegener, who was initially mocked for theorizing that the continents once formed a single land mass. Indeed, Smith appears to take a perverse, disarming pleasure in exposing her own vulnerability. She presents herself as perennially losing things, talking to inanimate objects and often confused. Smith weaves these threads — loss, coffee, death, a beach cafe, dreams, pilgrimages, memory, childhood, the cowpoke — like the musical themes of a softly unfolding fugue, eventually coming to rest in a dream, one prefigured in an early passage of the book.